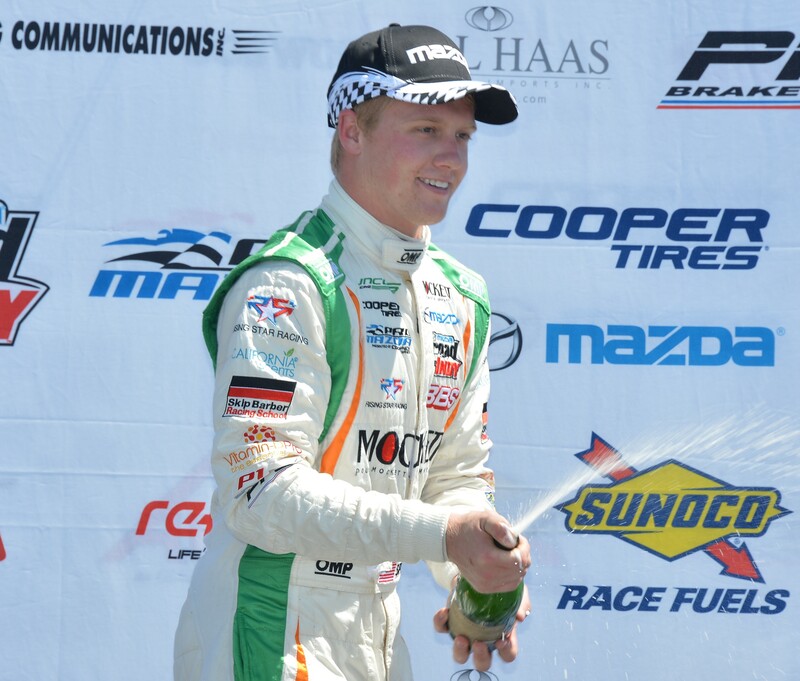 Last week we traveled south to Birmingham Alabama for the second round of the Pro Mazda Championship Presented by Cooper Tires. Barber Motorsports Park is one of my favorite tracks. There are so many different types of corners with lots of elevation changes and blind sections. The week started with a visit to the Children’s Hospital of Alabama to do some pinewood derby racing with the two other Rising Star Racing drivers, Neil Alberico and Josef Newgarden. We got the chance to build and design our own cars with the children to race against each other. Turns out I’m not very good at building pinewood derby cars because I didn’t win one race! It was a lot of fun to hang out with them and share our passion for racing. We had two practice sessions on Thursday which could have gone better. The car wasn’t the same as it was when we raced at Barber during the WinterFest but we continued to work hard to find some solutions. At the end of the day we were a bit off the pace in third position, we had one more practice session Friday morning to figure things out before qualifying. The car felt better Friday morning but we still weren’t where we wanted to be. Struggling to find the right balance. At Barber there are so many corners if you make a small improvement to the car it can make a big difference on the stop watch. My engineer, Ernie, made some final changes for qualifying and the car was really good. I put a lap together good enough for pole by just under a tenth of a second. We were really happy about this one because we had been about 0.4seconds off in the final practice so we made a big jump. I was pleased with the car but knew we could still make it better for the race. The start at Barber is critical because it is so hard to pass. Lots of corners and short straights aren’t ideal when you’re trying to make up positions. It was close going into turn one but I kept the lead and pulled away to win! Scott Hargrove finished second and started on pole position for race two because his second fastest lap in qualifying was 0.2s faster than mine. I knew I had to make it past Scott on the start or it would be very hard to get around him. I was on the outside of turn one and we went side by side through turns one and two but I squeezed through. I’m not sure how we didn’t hit each other! We must have been less than an inch apart at times. It was really hard aggressive racing but clean which makes it really enjoyable. There was a safety car early in the race and again the restart was incredibly close between us, I held him off and was able to pull out to about a four second lead. Once again, the car was great. 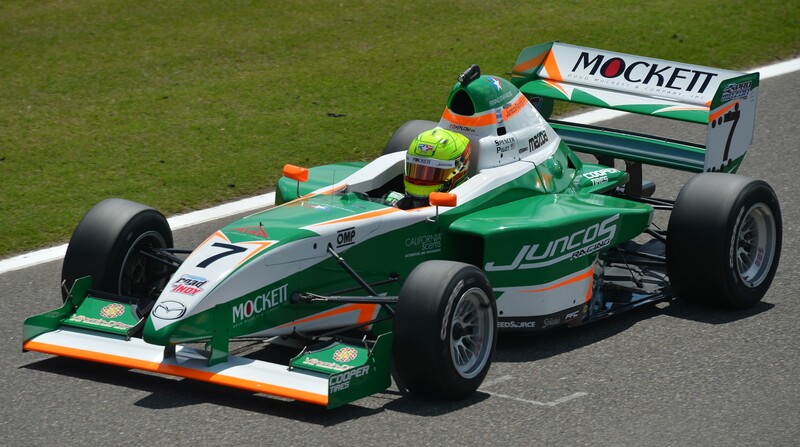 The Juncos Racing guys are working so hard and are giving me a car to challenge for the win every weekend. We made it four wins out of four races so far this season and have won all the bonus points available. Our next race is at the Grand Prix of Indianapolis May 9th-10th. It’s going to be very special to be racing inside the Indianapolis Motor Speedway. I can’t wait to get back in the car!